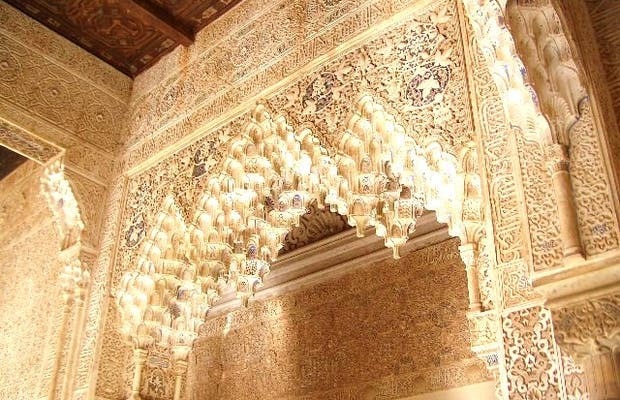 Despite what everyone believes, Muslim art does have or allow representations of human figures and you can see for yourself in the Kings' Room of the Palacio de los Leones. The name comes from the painting found in the central arch where ten people are represented in a cordial meeting, dressed in typical clothes of the Nasrid period, although during other periods, they were taken for judges and the hall was called "the Justice". The entire room is decorated with a wooden frames, plastering, muqarnas, and once again, the lights play with us and our senses. This place may be the most surprising of all since it is almost impossible to admire paintings of human-beings in a Muslim building. Take your time and enjoy this discovery. The sensation this room leaves you with is that of being in a Christian medieval palace, in which the arch is decorated with a fresco or mural painting typical of these places.